Kelby One membership gives you access to hundreds of photography courses on a large variety of subjects, taught by the world's top photographers. The membership also includes digital versions of Photoshop User magazine. They've also thrown in a black friday bonus of the Nik Collection by Google, a Photoshop plugin bundle that usually retails for $149 (and previously retailed for $499.95 before Google purchased Nik). The Nik software is widely acclaimed, and used by many photographers to help bring out the best in their images when processing. 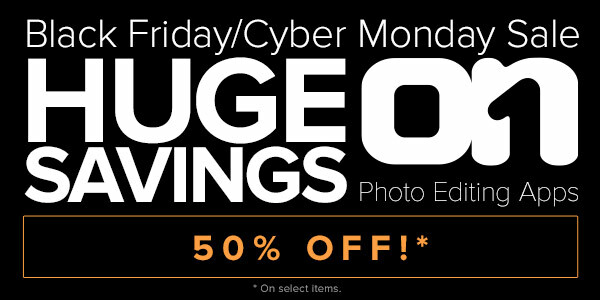 So, basically, you're getting a big discount on the Kelby One membership (40% off the standard price of $249) plus the Nik Software for free. I think this is probably one of the best Black Friday deals. Take advantage here. Similar to the Nik Collection, the Topaz Collection offers a variety of Photoshop plugins that you can use to enhance your photos. As well as plugins that can be used to dynamically alter the color, contrast, and microcontrast, the Topaz Collection includes quite a few other interesting utilities. Lens Effects can be used to selectively defocus parts of an image, creating a realistic blur that resembles out of focus blur from a real lens. ReStyle allows you to change the color palette and mood of a photo using the colors and tones of another photos. Very clever stuff. Star Effects allows you to change points of light into stars. Kind of like using a star filter on your lens, but with a lot more control over the result. Impression, Clean, and Simplify can all be used in different ways (or in combination) to turn images into drawings, watercolor paintings, oil paintings, etc. The collection includes 14 plugins in total, and normally retails for $429. 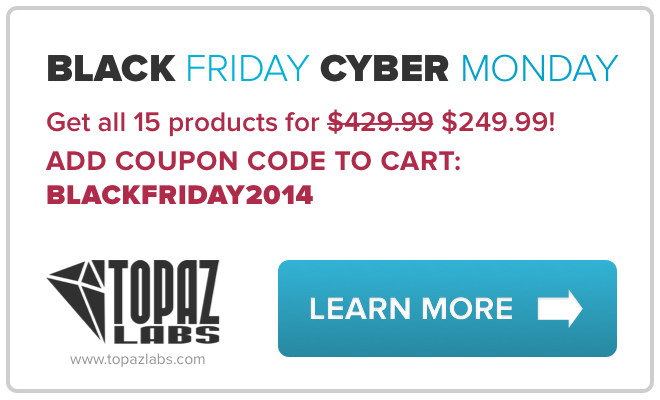 But for Black Friday / Cyber Monday you can use the coupon code BLACKFRIDAY2014 to get it for only $249.99, over 40% off. Get the collection here. 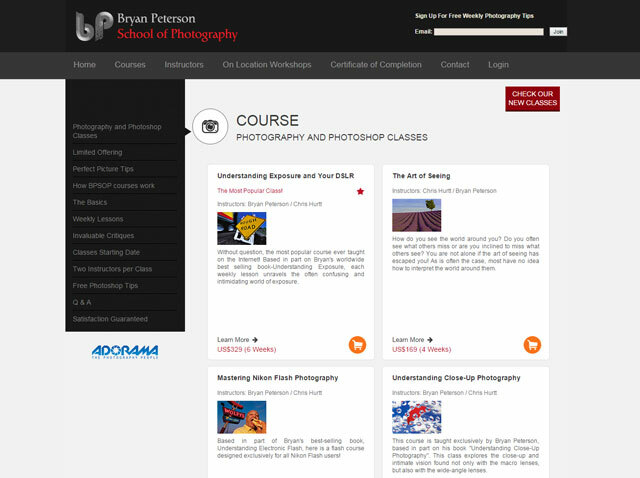 Previously known as the Picture Perfect School of Photography (PPSOP), the newly named Bryan Peterson's School of Photography (BPSOP) is offering 18% off all of the classes they offer. They offer a large range of courses run by a number of top photographers, covering many different aspects of photography. Unlike the courses offered by Udemy, the BPSOP courses are live courses that take place over a specific period of time. This doesn't mean that you need to be online at a specific time to watch the instructor live - the courses are still mainly taught using pre-recorded videos that you can watch when convenient. But you are expected to watch the videos on time and produce coursework - you will then be given feedback by the instructor on what you did right and what could be improved. How do PPSOP classes work? from PPSOP on Vimeo. Basically, it's like taking a course at a local college, but a bit more flexible, and with one of the world's top instructors at the subject you're studying. Enroll here. Similar to Topaz and Nik, onOne offer a range of different plugins, though onOne also offer their software as standalone versions (no Photoshop / Lightroom / Aperture needed). They are offering up to 50% off their various products individually, or $20 off Perfect Suite ($130, normally $150), which contains everything. onOne's software includes Perfect Enhance, Perfect Effects, Perfect Portrait, and Perfect B&W. These offer functionality similar to the sorts of effects / processing you can achieve with the Nik and Topaz collections. Where the onOne products differ are Perfect Browse, Perfect Resize, and Perfect Layers. Browse is designed to let you quickly preview, sort, and rate images. Resize is designed for uprezzing your images for large print output, and has a good reputation at being able to do this very well. Layers lets you work with layers, including masking and blend modes, it works well as a compliment to something like Lightroom that doesn't support layers. The discount on the Perfect Suite, which is the product I think is what most people are drawn to, rather than the individual software packages, may seem a bit stingy at only 13%. However, the Perfect Suite was very good value anyway, now it's just even cheaper. Grab your discount here. 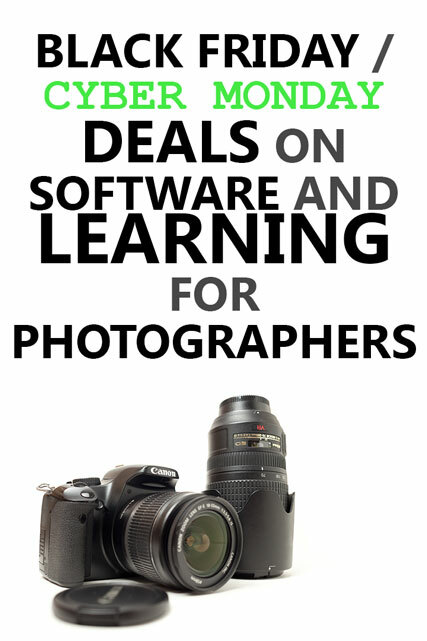 Udemy offer thousands of courses on a wide variety of subjects, which includes photography. Many of the courses are particularly aimed at beginner photographers, but there are some in there that will interest the more experienced photographer too. You can complete the course at your own pace and there are no time limits. The course prices vary quite a bit, so $19 might be a massive discount on the normal selling price, or it may be a relatively small discount - it all depends on the course you're interested in. At the start of Black Friday week the deal was $10 per course - I did mention this on Google Plus and Facebook at the time, so sorry if you missed it. But $19 is still a very good deal for many of the courses on offer. Take advantage here. Imagenomic offer the Noiseware, Portraiture, and Realgrain plugins for Photoshop and Aperture. Today you can use the code BF2014 when you checkout to get 30% off any of the individual products, or the bundle that includes all 3. Noiseware offers sophisticated removal of digital noise from images without adversely affecting the image sharpness. Portraiture offers a quick and easy way to smooth skin and enhance portraits. Realgrain allows you to add realistic film grain to your images and produce carefully toned black and white photos. I don't use any of their software myself, but I know that Imagenomic's offerings are held in high regard by other photographers (particularly the Noiseware plugin). You can get this deal here (and don't forget you need to enter the code BF2014 to apply the discount). 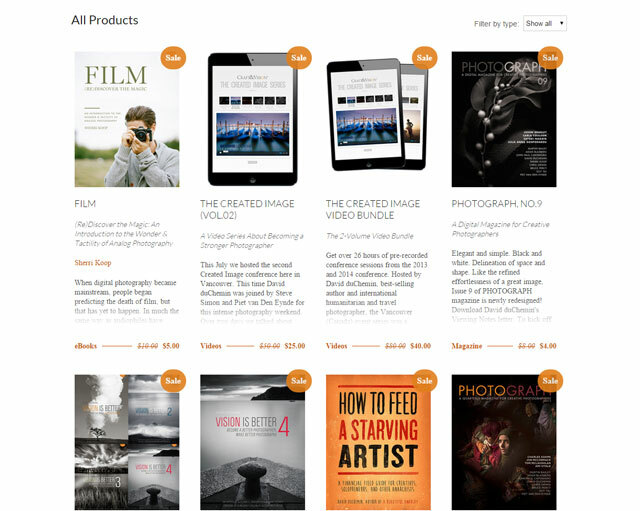 Craft & Vision have a large range of great ebooks covering virtually all aspects of photography. The books don't cover only the technical aspects of photography, but also the mindset, and how to train your mind to think creatively. The price varies depending on the product, but they tend to be quite keenly priced. Most cost around $8 - $20 normally, so that's $4 - $10 with the 50% discount. Increase your knowledge here. If you're interested in product photography, you may well have heard of Alex Koloskov, 'The Lighting Magician', and man behind Photigy.com. He originally found fame with his product photos making extensive use of liquids and splashes, but is especially accomplished at lighting. Careful lighting of a product is what helps the top product photos stand out from the quick ebay snaps taken with an iphone. (And he shows how you can get great product photos with an iphone so long as your lighting is good). The courses on offer demonstrate how to set the lights when shooting different types of products, and just as importantly, why the lights should be set like that. Often Alex works through a shot, showing you the process gradually building up from just a single light, to a multi light setup and then covering the post production too. 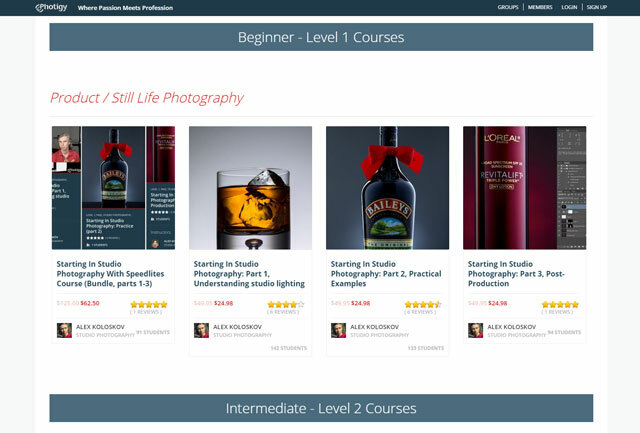 There are also courses and tutorials by other top product photographers available through Photigy. The Pro Corner subscription is a membership area where you can chat and get feedback from Alex and other product photographers to help you improve your craft. They have a monthly challenge, which is for Pro Corner members only. Improve your product photography and lighting skills here. Know of any more great Black Friday / Cyber Monday deals? Let me (and other readers) know in the comments below.